Jon Bosak led the creation of the XML specification at the W3C. From 1996–2008, he worked for Sun Microsystems. "Jon Bosak is the single person without whose efforts XML would most likely have failed to happen. He had come to appreciate the power and flexibility of SGML in his days running Novell's (excellent) on-line documentation repository at http://www.novell.com, and had acquired a conviction that HTML was not a suitable base on which to build the next layer of Web infrastructure. Jon's stewardship of the XML process has been marked by a combination of deft political maneuvering with steadfast insistence on the principle of doing things based on principle, not expediency." "It is to Jon Bosak's immense credit that he (like many of us) not only saw the need for simplification but (unlike anyone else) went and hounded the W3C until it became less trouble for them to give him his committee than to keep on saying SGML was irrelevant." In appreciation for his vision and leadership and dedication the W3C XML Plenary on this 10th day of February, 2000 reserves for Jon Bosak in perpetuity the XML name "xml:Father". In 2001, Bosak organized the OASIS Universal Business Language Technical Committee to create standard formats for basic electronic business documents. He led the UBL TC through the completion of UBL 2.1 in November 2013 and continues to serve on the Committee as Secretary. UBL was approved for use in European public sector procurement by decision of the European Commission dated 31 October 2014 and published as an International Standard, ISO/IEC 19845:2015, on 15 December 2015. Jon Bosak's father, Robert Bosak (1925–1987), began the family's long involvement in the computer industry in 1947 when he went to work on the first computer on the west coast of the USA. He joined RAND in 1948 to work on analysis and programming of scientific problems. In 1951, he joined Lockheed Aircraft Corporation, where he organized and directed the Mathematical Analysis Group. For a short time after his divorce in the 1950s, he shared an apartment with Bob Bemer, "the Father of ASCII." Bob Bosak returned to RAND in 1956 to become head of programming for the Semi Automatic Ground Environment (SAGE), the automated NORAD system that controlled US air defenses from 1959 to 1983 and strongly influenced the design of modern air traffic control systems. 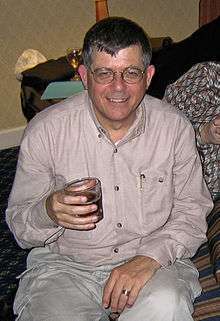 He was one of the designers of JOVIAL and principal author of the seminal paper An Information Algebra. ↑ Curriculum Vitae, Jon Bosak, ibiblio. ↑ Annotated version of the XML specification. ↑ Posting to the xml-dev mailing list, 199. ↑ "OASIS Universal Business Language (UBL) TC". OASIS. Retrieved 4 March 2015. ↑ "2014/771/EU: Commission Implementing Decision of 31 October 2014 on the identification of Universal Business Language version 2.1 for referencing in public procurement Text with EEA relevance". ↑ "ISO/IEC 19845:2015 Information technology -- Universal Business Language Version 2.1 (UBL v2.1)". ↑ An Information Algebra, Communications of the ACM, Volume 5, Issue 4 (April 1962).